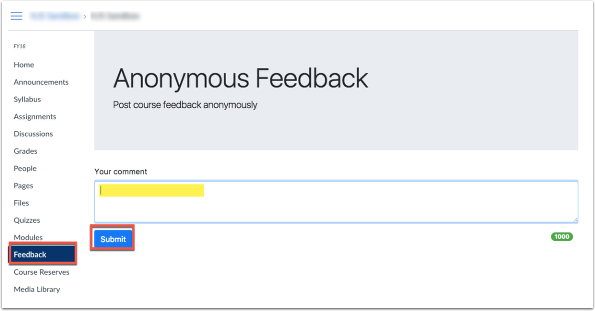 We have created a special tool to mirror the Anonymous Feedback tool within Classes*V2. Only official instructors and students enrolled within the course can use this tool. 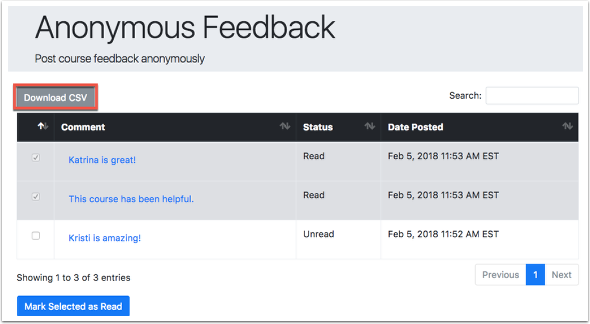 Anonymous Feedback is currently available in the course navigation by default for Yale College, Divinity School, and School of Law courses. If you are interested in using this tool for another course/school, please use this article to add it to your course navigation: Modify Your Course Navigation. For courses with multiple instructors, if one instructor reads the feedback, it will appear as “read” for all instructors. Once you click the Feedback tab in the Course Navigation, if there is feedback, you will see a preview of the comment . Click on the preview to read the full comment . You can also see the status of the comments, either read or unread . To mark a comment as read, select Mark as Read . You also have the option to download all of the feedback into a CSV file. In order to download feedback, click on "Download CSV". This will download your feedback onto your computer. 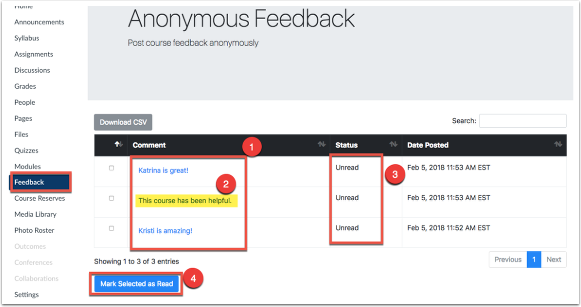 Students will see the Feedback tab in the Course Navigation. Once clicked, they can write up to 1000 characters of feedback. Clicking Submit will submit their feedback. Keep in mind, students can submit feedback as often as they like. Next: How do I use the Email Lists tool?